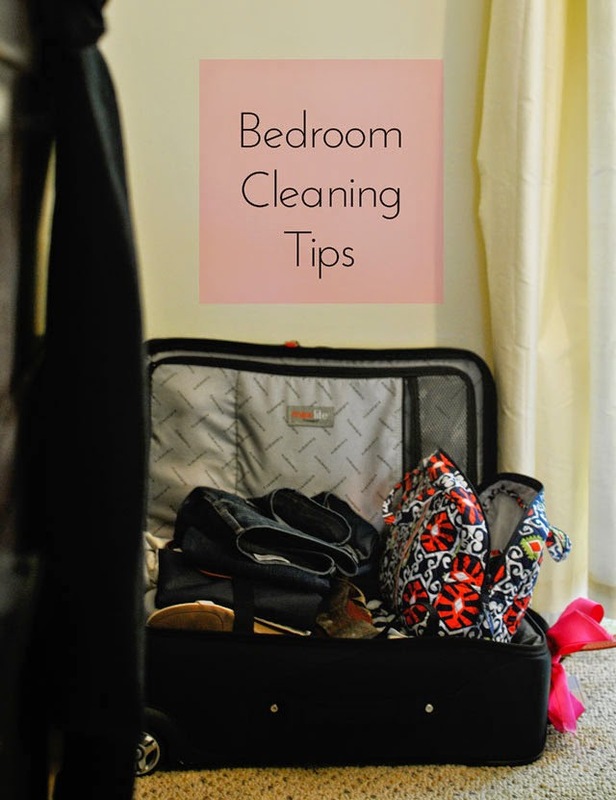 tips for tackling a mess. It always amazes me how messy our bedroom can get. I think it has to do with limited space, a tiny closet, and probably too many clothes. When I get home from work, I usually change into something comfy but refrain from putting my work clothes away. By the end of the week, I've managed to acquire quite a pile. 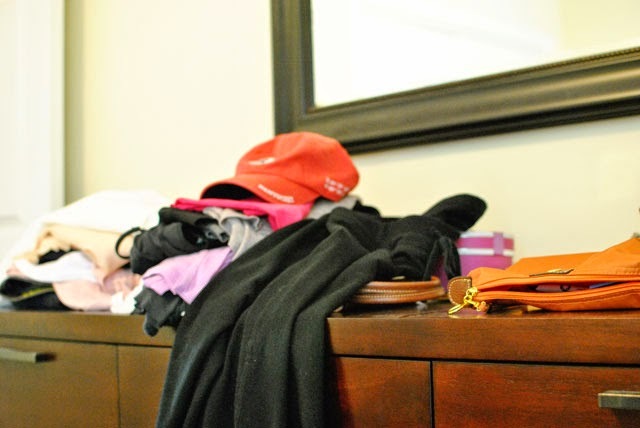 Additionally, there's always shoes, sweats, socks and other items that get strewn around the bedroom. Also, it is just me or does it take you FOREVER to unpack a suitcase from a trip?! I despise unpacking. 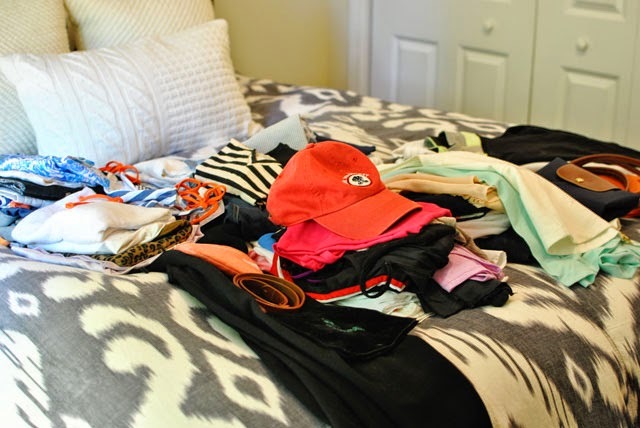 Tackling a bedroom mess is always last on my list when I'm cleaning up the apartment. I guess it's because I can just shut the door and pretend like it's not messy. But, it really does stress me out to go to bed amidst all the clutter. Ever since I was a kid, I've been employing this bedroom cleaning strategy and it seems to work really well for me. After making the bed (which instantly makes the room feel neater), I throw all the clutter on my bed. Clothes, bags, socks, everything. Toss it all on the bed so that the whole mess is now confined to one place. Survey the mountain of clutter and start sorting things into piles. Make a pile for all the clothes that need to be hung back up in the closet. Toss dirty clothes in a bin. Fold scarves. Pile t-shirts and jeans. 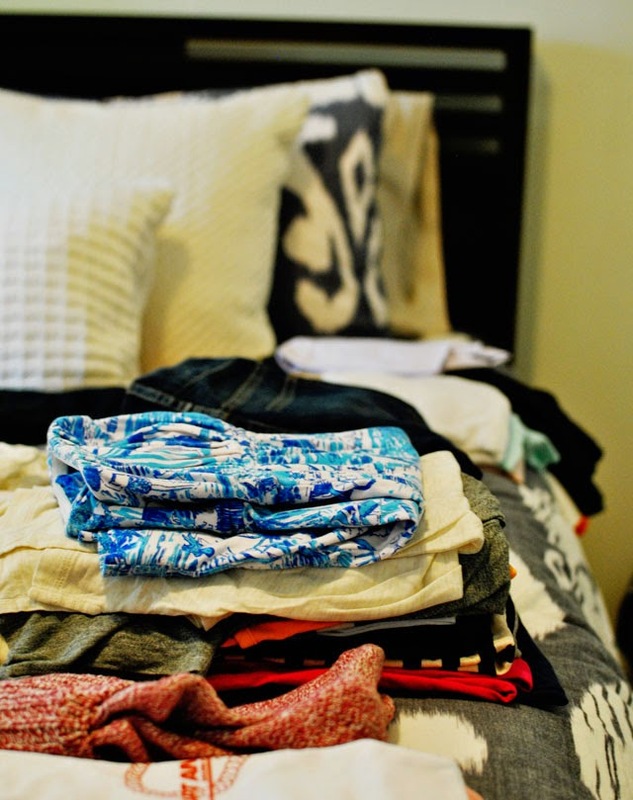 Make sure everything is organized in a logical way on the bed. Now that you have everything sorted, it's easier to put things away quickly. Hang clothes. Place t-shirts in the drawer. Match lose socks and toss in a drawer. Knowing that everything has a place really helps me keep the bedroom tidy. Shoes go in clear shoe boxes. Scarves go in a bin under my nightstand. Jewelry goes in a drawer or hung on a hook. 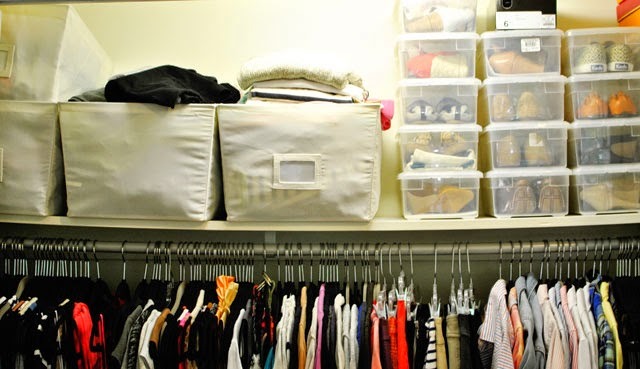 Sweatshirts and sweaters get folded in bins in the closet. Every few weeks, I take a couple of extra minutes to go through my t-shirt drawer and make sure all the shirts are folded and see if any of them need to be edited. I do the same thing for other drawers like pants and socks. This really helps to cut down on extra clutter and ensures that I'm only holding onto things I actually wear. Things that don't make the cut end up in a pile to take to Goodwill.